If your plumbing has been properly installed and taken care of your plumbing should ever freeze, but if the weather gets really cold your pipes could wind up freezing. 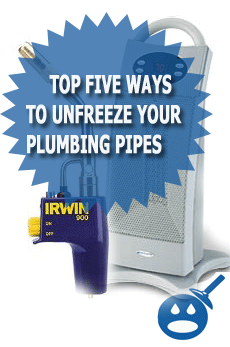 This guide will give you the top five ways to unfreeze your pipes. There is a few things that you will want to do before unfreezing any pipe. The first thing to determine is if the pipe you are about to unfreeze has any pressure it it. This is common if the frozen pipe is a water line. If the pipe that is frozen is a drain line it won’t be full of pressure normally because drain lines are not meant to hold pressure. If you determine that the pipe that is frozen is a water line or another type of line that has pressure it in you will want to shut of the source. For example if the water main or another domestic water line is frozen in your home you will first want to shut the water off before unfreezing the line. The reason you will want to shut a pressured line off before you unfreeze is because if the pipe has cracked or split the liquid in the pipe will spray out everywhere when you thaw the pipe. Unfreezing the frozen pipe ca be simple once you locate the section that is frozen, so if you have located the section that is frozen continue to the steps below so you can see the best and top five ways to unfreeze your pipes. How To Unfreeze Your Pipes With A Piping Hot Machine. You can use something called a “piping hot” machine to unfreeze your pipes. This machine works by using to spring loaded clamps that attach to the section of the pipe. Once you connect the spring loaded clamps to the pipe you turn on the machine and the machine heats the section of pipe between the clamps. This machine can be rented from a local plumbing supply house or off course you could also buy it new . If you have a heat gun you can use that to heat the frozen pipes as well. Just take the heat gun and point it on the frozen area of the pipe and move it back and forth spreading the heat between the two frozen points. If you have a hand held plumbers torch or even a b tank you can use the torch to unfreeze copper or a metal based pipe that has water in it only . You do NOT want to use a torch to unfreeze anything that may be flammable. So make sure to only use a torch on lines that contain water. Also be careful because using a torch will heat the pipe fast and if you heat the pipe to much you can not only unfreeze the pipe but melt the solder out of the copper fitting if you are not careful. Electric Plumbing heat tape is not only a great way to prevent your pipes from freezing but also a slow but effective way to defrost or unfreeze the frozen pipe. You simply just have to wrap the pipe with the heat tape and then plug the end of it into a 110 outlet. Heat tape can also be directly wired in by an electrician if it is needed in any areas that pipe insulation will not work. You can use a portable space heater to also unfreeze your pipes if they are in an area that is big enough to get the space heater into. The other down side to using a portable heater is that most of them have only around 1500 watts of power and that is not that much BUT it will work to unfreeze your pipes. This method will also take much longer then then other methods of unfreezing a pipe like we mentioned above. 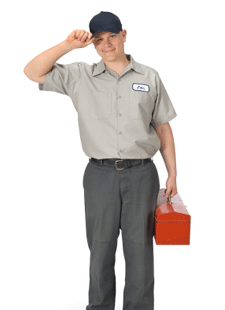 Proper preventive maintenance can prevent the freezing of any type of plumbing pipe anywhere in the world.It’s actually really cost effective and could cost as little as $100 dollars to protect your plumbing. Using things like pipe insulation, electric pipe heat tape, electric space heaters and plumbing water lines in inside walls only helps to prevent your pipes from freezing. If you have to call a professional licensed plumber to unfreeze your pipes it could cost you hundreds and sometimes thousands of dollars depending on what has froze and the damage that needs to be repaired after everything is thawed. I live in an old house that is raised with plumbling under the house. My pipes are insulated and the pipe that is closest to the exterior wasll by the kitched has heat tape as well. It has been freezing here in the south for a week now and I have not had any problems. I have also been running the hot and cold water(even stream) in the the bathroom and kitchen sinks.My washing machine is inside and in the middle of the house. I’m wondering if I can wash clothes in these conditions or if you think my pipes or drain could be frozen? HI, I HAVE A PROBLEM, ABOUT A MONTH AGO I NOTICED A SINK HOLE IN MY YARD, WELL TOLD MY LANDLORD, AND SHE WAS GOING TO GET IT DUG UP, AND FIND OUT THE CAUSE, BUT IT KEEP RAINING FOR ABOUT 2 WEEKS, THEN ALL OF A SUDDEN THE COLD TEMPS CAME, GOT DOWN TO ABOUT 7 DEGREES. I STARTED A WASH LAST NIGHT AND WAS IN THE BEDROOM, AND NOTICED WATER EVERYWHERE. I GUESS THE DRAIN FROZE. COULD THESE TWO THINGS BE CONNECTED? WHAT SHOULD I DO? My pipes are frozen bad and i live in a very old house with a dirt basement and cant get to the pipes down there. What can i do to unfreeze them? plumber will help unfreeze it . My bath room was frozen no water so I took a shot and poor salt down with boiling water not to hot and it worked. Had to buy water and salt the one we put n our food . Boy I was lucky I put it in the tub and bowl didn’t flush blow . I wated. For the tub first. Ian good . I have a gray water drain that is about 250 long. There is a frozen blockage about 30 feet from the house. I’ve tried draining it and pouring 5 gal of boiling water down draining again and repeated a few times while using a snake with no success. Any suggestions?